You can hardly pick up a paper or turn on the television today without hearing people talking GREEN, and the Greening of America. What are people talking about when they say GREEN? 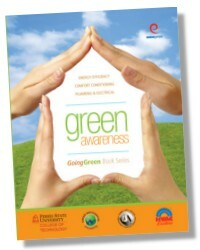 The issues at hand are the raising cost of energy, energy efficiency, performance and global warming. Purchasing new high efficient equipment will not necessarily reduce the cost of heating and cooling a home. Energy efficiency is not simply purchasing a new high SEER system, is is about proper installation to manufactures specifications. A quality installation will save energy and money. (Heating oil futures his a record high in Mid October, up over 40% year to date). The Annualized Fuel Utilization Efficiency (AFUE) rating provides the consumer with a number that represents the percentage of fuel efficiency achievable by gas and oil fired furnaces and boilers. How can a HVACR service technician verify that they have properly installed or serviced a system the manufacturers specified AFUE rating? This can only be accomplished through combustion analysis, an essential aspect of furnace and boiler efficiency . Combustion analysis should be performed when installing a new furnace or boiler and at regular interval. Combustion analysis is the measurement of a combustion systems flue gases to determine the completeness (efficiency) of the combustion process. 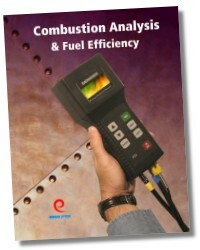 Combustion analysis is only the first step in maximizing fuel efficiency. An HVACR service technician must understand the Air/Fuel ratio, and venting adjustments necessary to accomplish efficiency. Several companies manufacture combustion analysis test instruments, including, Fieldpiece, Bacharach, and Testo. Combustion analysis requires more than tools, it requires knowledge of the combustion process and how to use the instruments. 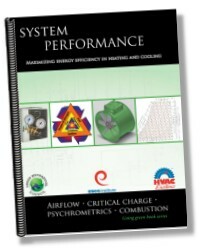 To make certain that the HVACR service technician is properly trained in combustion analysis, renowned trainer and author Erik Rasmussen has written a new training manual titled "Combustion Analysis & Fuel Efficiency". The world has entered the 21st Century and the push to reduce energy consumption and greenhouse gas emissions is stronger than ever. With dwindling resources and an ever increasing demand for power, it is time to start taking the simple measures to make the changes needed to reduce the energy consumed by the fuel burning, emissions releasing appliances we work on every day. "Combustion Analysis & Fuel Efficiency" addresses carbon dioxide formation and release, carbon monoxide generation, thermal heat transfer and flame temperature, steps and procedures to increase efficiency and reduce emissions. Readers should expect to increase their knowledge of combustion, the combustion process and combustion control. Topics covered include: The dynamics of Carbon Dioxide production, The release of heat and the Oxygen relationship, The living breathing appliance how to ensure that your appliance is not suffocating. The combustion analysis manual is intended to raise the awareness about all things combustion and what all technicians should know being in the HVAC/R trade. "Combustion Analysis & Fuel Efficiency" covers draft and venting of fuel fired appliances to heat transfer and what effects combustion has on Efficiency. Combustion (FIRE) since the beginning of time has been a magical and sometimes mystical thing, that all humankind has struggled to conquer and control. The secrets to the realization that combustion is not that magical nor mystical are contained within the pages of "Combustion Analysis & Fuel Efficiency". Read and become your own master of FIRE. Erik Rasmussen. 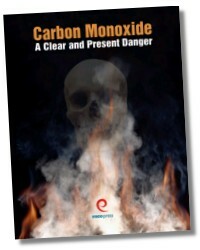 Erik Rasmussen is the International Program Manager for the Carbon Monoxide Safety Association (COSA). COSA is a not for profit organization that raises the awareness to the health hazards, inefficiencies and liabilities of carbon monoxide through training and partnering with certified educational programs and community, private or other group requesting assistance in their safety efforts. In addition to his position with COSA, Mr. Rasmussen: Serves as President of ESCO Press International based in Trenton, Ontario, Canada, Co-Author of "Carbon Monoxide A Clear and Present Danger" the campaign publication to "Combustion Analysis & Fuel Efficiency", Continues to stay current on all technologies through his own service company that provides service and installation of (Natural gas, Propane, Oil heat, Air conditioning). Mr. Rasmussen was a Combustion and Carbon Monoxide safety instructor for Bacharach Manufacturing, and community college instructor prior to joining COSA. Overall, I think the book is an excellent technical reference, practical learning took and field guide." John Tomczyk, Professor / Author Ferris State University. Energy efficiency and reduced energy cost can be achieved through a quality installation. This can be accomplished through proper understanding of combustion and performing a combustion analysis. Energy efficiency require more than installing more efficient equipment.